This NT510 comes with one free car brand software and OBD2 software. When you place the order please choose the software type based on your needs. Available brands are Chrysler,GM, Honda, Accura, Kia, Toyota,Lexus, Sicon, Land Rover, Jaguar, OPEL, Vauxhall, VW, AUDI, Seat, Skoda, BMW Fiat,Porsche,Mazda,Maserati,Ferrari,Aston Martin,Volvo. Users are allowed to buy extra car software (each software cost 60usd). One machine can have 5 kind brand software at most. Technicians will just have to pay for what they really need, which will greatly reduce their costs. can't retract the calipers on a 2005 BMW x5 4.4i e53. The E53 does not have electronically controlled calipers. Part 2:Which diagnostic tool is best on 2000 BMW E53 2002 E46s for home? To reset the Oil and Inspection (IC module) on the E46s. 1). Peake tool works fine with my 2000 E53 and our 2002 E46s, but is limited to DME diagnosis and isn't exactly user-friendly. 2). Carsoft software will read pretty much all modules on the 2000 E53 via the BMW-proprietary "DLC" socket under the bonnet, except for the DME & EGS which need to be read from the ODB2 socket inside. On the 2002 E46s which just have ODB2 it will just read DME, and I have to use my Peake tool on these to reset the Oil and Inspection (IC module) on the E46s! 4). Carly kit: I tested with the Lite software. Varied results, not helped by the fact that it's not partiuclarly intuitive and/or I'm not that bright! 2000 E53 X5 4.4i via ODB port: 2/24 modules "answered"
2002 E46 330Ci vai ODB port: 17/30 modules "answered"
I wasn't able to fathom which of the modules "answered" becuase it just seems to show a list on the next screen 2/2, 3/3, 1/1, 5/5. having for the E46 at l least, though probably not with my E53! 5). BMW inpa: I manged to get my USB-FTDI serial drivers issue sorted and now I can "see" the car in INPA. Not that that helps me a great deal as it's *so* complicated I have no idea how to make it do anything except read a few codes! 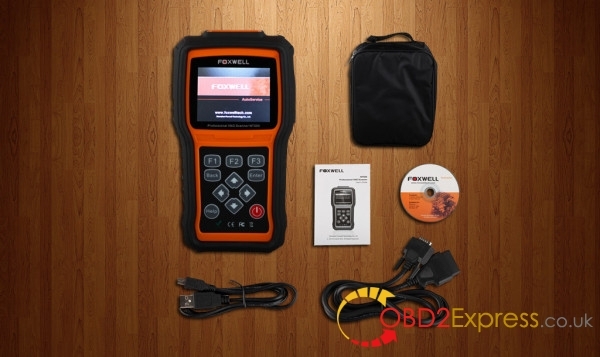 Another up and coming stand alone tool that is looking very promising is the Foxwell NT510 BMW/Mini scan tool. One nice feature of Foxwell NT510 is it appears to support straight up OBDII (covering most, if not all of the common OBDII protocols) with the addition of BMW specific/proprietary code reading and BMW specific service related features. I received one Foxwell NT510 for evaluation and had spent several hours with it so far and I am liking what I am seeing so far. Played around on my BMW E70 for a bit, covers ABS, Airbag, Electronic Parking Brake, some EWS/CAS, Active Suspension, Service Resets for $200. Foxwell NT510 can be updated to include VW/Audi/VAG, Mercedes and some other manufacturers for approximately $70 for model line. These updates are manufacturer specific. My e70 I have codes all sorts of convenience features for things like door locks, windows, tailgate and lighting. I also suggest OBDFusion as this App does a very good job with standard OBDII Logging and all you need to do is keep and interface in the car and you will always have at least an OBDII tool at hand when out on the road. Q: Can I use Foxwell NT510 to find which cylinder so I am not replacing one plug at a time to find the bad one? If so, which function could I use? A: If you have a misfire then your will have a fault code. Fault code are always retrievable until they get deleted. Search for the fault code and it will tell you what cylinder or just google the code and I’m sure the definition will pop up somewhereIf you replaced plugs and you getting misfires then the problem is your coils. Reporting back: Registering a battery is super easy. It gives you the option to say that you upgraded the Ah rating as well if you are having trouble finding an OEM spec battery. The Maxx ever start H8 I picked up from Walmart (after reading a few threads, that’s what I landed on) did not have an amp hour value. I read that someone just registered it, didn’t do any coding, and was still happy with it after four years so I went with just a registration also. Now, regarding the misfire…. No codes came up. This shudder is only detectable at idle and is somewhat random. It happens after sitting at idle for a few seconds after driving. Generally have to wait longer after stopping at a light if the car is warm.The only code was 2E8D which I’m gonna say was from replacing the battery. Will clear it and see if it pops up again. Q: Can you reset air bags? A: I’ve been successful on an E53 and E90. Q: if it codes battery? Q: Will the NT510 Multi-System Scanner with 1 Free Car Brand Software+OBD Free Shipping By DHL support resetting the adaptation setting for the transfer case after changing the transfer oil on a 2005 BMW X5 (E53) ? A: NT510 support the function you want. Q: Can this engage the fuel pump? Need to do this after a fuel filter change to eliminate any air trapped in the fuel lines. Currently have to hook up a power supply directly to the fuel pump to start it.Does it have any specific modules for the N57/M57 diesel engines? Q: Has anyone received this warning? Can’t get around it, maybe because I have a jb4? Any advice would be helpful. A: Disconnect your JB4, its probably using a bus that the scanner needs to use. Q: Foxwell NT510 can code injectors? A: Yes, just did mine yesterday with it, very easy and intuitive to use as it guides you through the process. It has access to the TCU and TCU parameters yes. Q: Had a problem coding injectors with NT510 scanner, I’m inputting the two 3 digit codes and either the DME or the tool won’t save the changes. A: You have to re-enter all 6 digits together no spaces. You cant just do 3 digits. Also the DME separates the 6 digits code for the injector into two 3 digit pairs automatically. Finally, I think I got it to work. NT510 scanner states the codes are “not ok” and intermittently displays the “correct” numbers after going back to the beginning of the process of coding them multiple times. Might be a little buggy… Interestingly, there is a note in the prompts that says the last digit may be altered/adjusted by the DME. Sure enough. The car seems to run a lot better with the index 12 (7 & 8 came out). Then I got correct guide: the DME defaults to a low range of the injectors specs by -/+ 1 of the last digit of the set. That is normal. If you want the full range of the injector spec ie closest to the actual numbers displayed on the injector, then you need to offset entry.Example, if you enter 477 and the DME changes it to 476, then enter 478 to target 477. If the DME adjusts to 479 then you will have to go back and enter 477 and 476 will be the highest you can go staying within the injector specs and not exceeding it. Q: When I tried to save the values, the tool said they were not valid. Any idea what I did wrong? A: update the software for the tool, then select your device first by VIN, it will load a pre profile. Then go back and select your chassis and model manually. Go to service and try entering the values again. You can also try saving each cylinder entry one at a time. Finally solved.